MIRACLES HAPPEN. JUST ASK MEGGAN HILL-MCQUEENEY. Meggan Hill-McQueeney was three when she fell off Popsicle and broke her left arm — an especially unfortunate accident for the congenital amputee born without a right one. Meggan’s parents were determined that their one-handed daughter would not suffer in a two-handed world. She was six months old when she was fitted with a prosthetic arm. Meggan resisted using it, then despised it, and ultimately refused to wear it. Meggan got back on the horse, in this case a Shetland pony. She fell off again and broke another bone. Bone after broken bone after many broken bones. But Meggan learned to ride. She learned a lot more than how to hold the reins. Meggan learned to pick up a brush and a bridle and a saddle and a pitchfork and a bucket and a wheelbarrow and a hay bale. She acquired confidence and purpose. The pony didn’t give Meggan her life. He helped her find it. “Popsicle taught me to fear less and live more,” she says. Today Meggan is president of BraveHearts Therapeutic Riding and Education Center. Military veterans suffering from physical and emotional trauma and people with special needs have the opportunity to experience the transformation that Meggan did. Hank, Maverick, Boone, Trick, Dan and Mighty, 32 in all, carry on in the tradition of Popsicle. 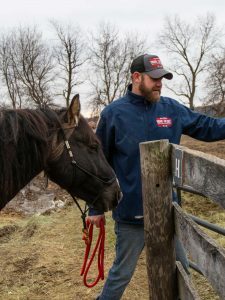 The home of the nation’s largest veteran-focused therapy riding program is actually two remarkable places on the Illinois prairie. BraveHearts in Harvard and BraveHearts Poplar Grove are connected by a 15-mile stretch of Interstate 173 in Boone County, a two-lane highway through farmland that seems on both sides to stretch to infinity. Conveniences are to be had along the way in Chemung (population 510) and Capron (population 1,370). The Grove Inn makes a damn good veggie burger and, clearly, is a loyal supporter of North Boone High School: Go Vikings. “Horses are angels wearing saddles,” says USD alumna Meggan Hill-McQueeny. The Poplar Grove location — BraveHearts at the Bergman Centre, officially — is abuzz on a sunny and crisp fall Wednesday. This weekend, 100 or so Special Olympians, and another 500 family and friends are expected for the 2018 Special Olympics Equestrian Games, and the staff is busy in preparation. Amber Eck, BraveHearts’ volunteer director, is showing me around the Poplar Grove farm. I ask if all those people, and the cars that bring them, will spook the horses. syndrome who wanted to ride him. Meggan launched Cowboy Dreams, a therapeutic riding program in Barrington, a few METRA train stops toward Chicago from Harvard. Cowboy Dreams and Meggan Hill-McQueeny got the attention of Marge Gunner, the co-founder of BraveHearts. When Cowboy Dreams eventually shuttered its barn doors, Gunner saw her opportunity. BraveHearts offers physical, occupational and speech therapies, including activities to improve trunk strength, balance, range of motion, fine motor control and improved communication for those with communication disorders. 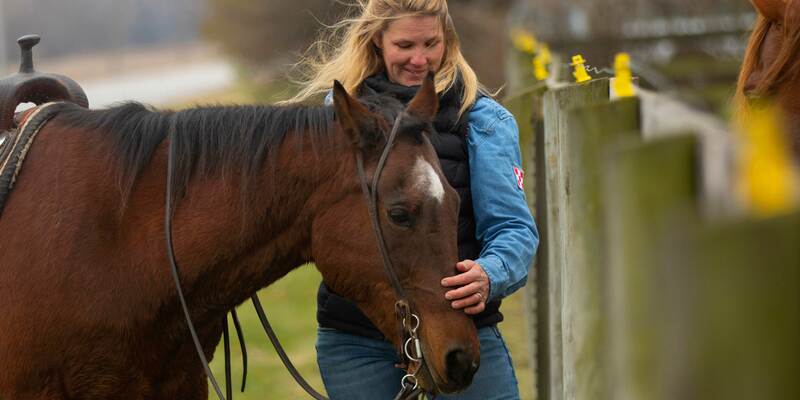 Equine-assisted psychotherapy helps those with anxiety disorders, autism, childhood neglect/abuse, conduct disorder, grief, loss, eating orders and PTSD. The vets are referred to BraveHearts, typically through the Veterans Administration, in seven-week session blocks; the vet and a family member/caregiver take the lessons at no cost to them. Anyone entitled to VA benefits is eligible. “Those buses come up and we have no idea who is getting off, other than they are veterans and they are somehow damaged,” Meggan says. I am in the middle of an enclosed round pen at Harvard with Hank, a majestic brown gelding with a white star above his eyes. Meggan is on the perimeter, instructing me how to direct Hank’s feet. Right. Left. Be still. Ultimately, I’m able to get Hank to come to me. We repeat the exercise, and each time he comes close he aligns his massive shoulder with my chest. It’s not an accident. It’s not by chance that Meggan selected Hank as the horse for me to work with. Of all the BraveHearts’ herd, Hank may be the most patient. Once, Meggan tells me, a veteran was admiring Hank from the vantage point of a wheelchair. Her eyes mist over. The passion in her voice is matched by the conviction. That was the case for Air Force veteran Ron Hathaway. He says after his 24 years in the service and another half dozen in the corporate world, he was at the end of his emotional rope. On his first visit to BraveHearts, Hathaway was mounted on Boone. After more than 2,000 volunteer hours — during which he worked closely with Meggan — Hathaway became a riding instructor. The veteran who at one point knew nothing of horses is now the BraveHearts barn manager. Many of these vets and special needs kids seem to have lost or been unable to demonstrate the ability to trust. In that way, they are very like the wildest horses in the BraveHearts’ stables. There are some 40,000 mustangs running free through the open lands of 10 or so western states. Another 50,000 live in pens, herded there by ranchers and Bureau of Land Management (BLM) helicopters. None had ever been touched by a human being before being captured, castrated, inoculated, freeze-branded and removed from their herds. Four of them came to BraveHearts as part of Operation Mustang, a program that pairs adopted mustangs from BLM with veterans. Headland spent four years in the army as an infantry mortar man. He recalls his “final kill.” Caught in a surprise attack, he grabbed a rifle. Through the weapon’s scope, he sighted a wounded Afghani soldier crawling for safety about 700 meters away … some 765 yards. “I hit him in the back with a few” shots, he says, what soldiers call a “double tap,” pumping extra rounds into an already dead body. Headlund’s bright, alert eyes suddenly seem to be focused on something far away. His voice gets soft. “I still see it sometimes,” he says. The rocket-propelled grenade fired by the Taliban didn’t hit him. It just came close enough. “My back was ripped apart,” he says. Veteran Mitch Headlund credits BraveHearts for the “miracle” of getting his life back. Headlund came back a broken man, physically and emotionally. In addition to the back injury that put him in a wheelchair, he suffered a traumatic brain injury. Every bit as agonizing as the physical wounds were the horrors he relived in his own head. He was on a diet of 54 pain pills a day. His marriage suffered, then dissolved, deepening already cavernous wounds. “I hated everything,” he confesses. “I created a black hole around me so no joy could come into my life.” Then his mom pushed Headland and his wheelchair into the BraveHearts facility in Poplar Grove. Meggan saw Headland begin to come out of his shell. She gently urged him to consider becoming a riding instructor. Once an angry and withdrawn recluse, the former infantryman is now a certified instructor and exercise rider at BraveHearts. He’s also a college student studying to become a counselor. “BraveHearts gave me back my life,” he says. Part of my visit to BraveHearts — of course — included getting on a horse. I mounted Dan more deftly than might be expected of a guy who grew up in the suburbs (though my dismount was considerably less elegant). Meggan showed me how to hold the reins: palms up, with the leather intertwined in my fingers. I resisted the impulse to hold the reins like bicycle handlebars and learned to steer Dan gently left then gently right. After a few minutes, I got used to the fact I wasn’t going to hurt him if I spurred him. And it happened. We figured it out, ol’ Dan and me. I learned to rise in the saddle and fall with Dan’s gait. I could feel him feel me trying, and he tried to help me. I looked in the distance, an endless cornfield here, a tree-spotted horizon there, where it seemed no problems could possibly live. Trotting, I could almost hear Dan’s horse voice: “Let’s gallop.” I know he could hear me back: “I’d love to, buddy, but: corral.” It was magic. Magic. The same word Meggan used talking about Popsicle, that Air Force veteran-turned-barn manager Hathaway used to describe his experience, that infantryman-turned riding instructor Headland used, the same word used by Amber, the volunteer director. Until I came to BraveHearts I thought the only magical horses were unicorns. I left BraveHearts feeling quite different. To learn more, go to braveheartsriding.org. ‘eyes misting’ matches how I felt — absolutely awesome and I thank you for this article. I’m sharing it with several others AND a nephew who counsels vets. Thank you so much, Meggan! To receive an email with a link to the online version, rather than the print edition of USD Magazine, fill out this form. We want to hear from you! To submit a class note, either email classnotes@sandiego.edu or complete the form online.